Ask and ye shall receive. I was lagging a bit yesterday, coming off two uninspiring calendar whiskies in a row, when I formally wished for better things to come today. 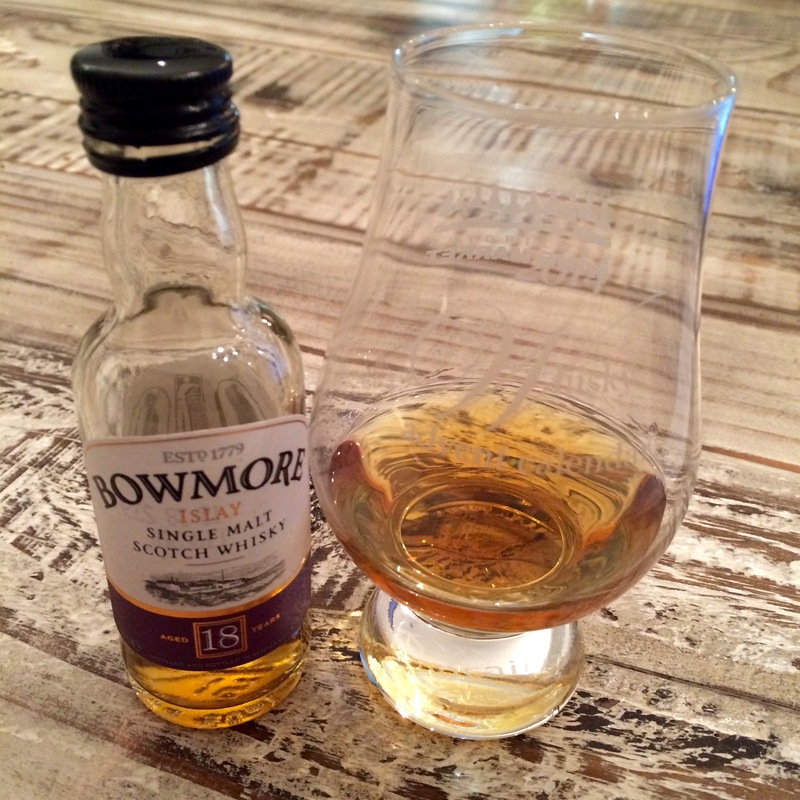 BAM – Bowmore 18 Year Single Malt, thank you very much. This is Bowmore’s second appearance in the calendar, having previously impressed me quite a bit with their 15 Year offering The Darkest back on Day 8. The 18 Year is the graduate level version of its predecessor whisky, retailing for $114 and worth every cent of that price. This specific age of scotch has only been available from Bowmore since 2007, when it replaced the bizarrely prime-number-matured 17 Year in the distiller’s collection. I find it amusing that Bowmore has been around for 235 years (it’s Islay’s oldest distillery, having opened in 1779) but didn’t have an 18 Year in their lineup until I was 27. Talk about a whisky rebound. Wow. I admit I was slightly nervous to try this whisky when I was price-checking it and saw one shop commenting that it tasted like “salty kippers and coal smoke”. Mmmm. Luckily my tasting experience evoked less fish. First, the deep, coppery amber colour on the 18 is a beautiful thing to behold – it’s probably the best-looking scotch I’ve had so far. Second, as with the Bowmore 15, even though this is an Islay whisky, the peat levels are fully in control and perfectly balanced with the other flavours: I definitely got some potent smoke and mossiness on the nose, but it melded seamlessly with sweeter, bolder aromas, marmalade and pineapple and caramel. And it got even better once I had a taste. The mouthfeel of this scotch is almost as good as the flavours: lush and creamy, ultra-silky. It tastes, and feels, like a mouthful of smoked maple syrup (presuming/hoping that this sounds appetizing to you, as it’s meant to be a compliment). Butter tarts, saddle leather, chocolate orange and linament round out the flavour profile, but the smokiness goes deep and lingers long after you swallow. This is absolutely dynamite, and may well challenge for my favourite whisky of the whole calendar so far. Track some down!